Photo Credit: Brad Keppel for Speedaymedia.com. CONCORD, N.C. (Sept. 30, 2018) – Sunday’s inaugural Bank of America ROVAL™ 400 – arguably the most anticipated Charlotte Motor Speedway race since the first superspeedway night race in 1992 – exceeded the hype in spectacular fashion. A dramatic 109 laps of racing built up to a last-lap, last-turn accident between leaders Martin Truex Jr. and Jimmie Johnson, which paved the way for Ryan Blaney to emerge unscathed to record a stirring victory. The first road-course playoff race in Monster Energy NASCAR Cup Series history served up a double dose of excitement. Sixteen playoff drivers battled to maintain their championship hopes in the cutoff race of the first round, contested for the first time on Charlotte’s 17-turn, 2.28-mile ROVAL™. Kyle Larson led a race-high 47 laps, won Stage 1 and figured to be in the driver’s seat to win. A lap-104, Turn-1 accident following a restart left Larson’s car with severe damage and eliminated contenders including Kyle Busch and Brad Keselowski. Truex inherited the lead and engaged in a breathtaking battle with Jimmie Johnson over the final two laps. Heading into Turns 16 and 17 – Charlotte’s new frontstretch chicane – Johnson dove in deep, spun his car sideways and collected Truex as Truex exited the corner. Blaney beat Jamie McMurray and Clint Bowyer to the finish line as Johnson righted his car and finished eighth. 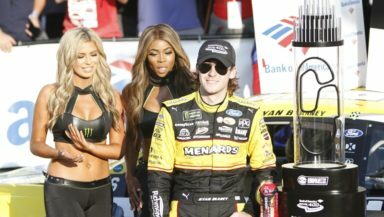 Even after Blaney recorded his second career victory and Truex crossed the line 14th, the drama wasn’t over. Larson needed to gain one position on the final lap in order to advance in the playoffs – which he picked up after Jeffrey Earnhardt spun following contact with Daniel Hemric. Larson and Aric Almirola were the final two drivers to advance to the Round of 12, as Johnson’s spin and ensuing result saw the seven-time series champion lose a tiebreaker for the final position after an afternoon of exhilarating action on the ROVAL™. To purchase 2019 Bank of America ROVAL™ 400 tickets or to buy tickets to upcoming speedway events, fans can call 1-800-455-FANS (3267) or shop online at www.charlottemotorspeedway.com.